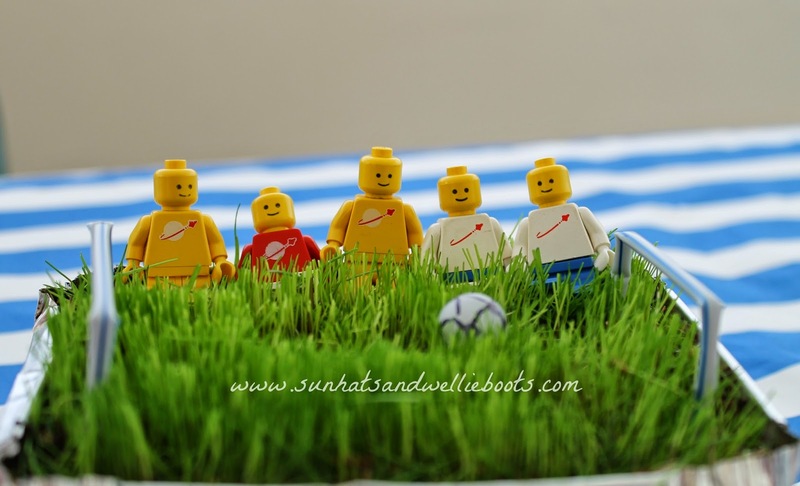 Have you been following the highs & lows of the World Cup over the past few weeks? We've loved watching the games, & the sporting skills of the players taking part. 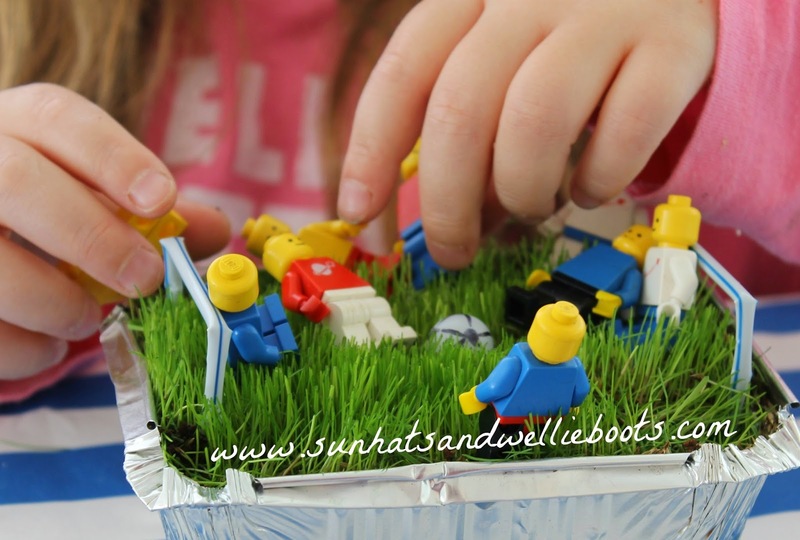 Inspired by the many matches we thought we'd grow our own mini football pitch ready to recreate some of the football highlights. 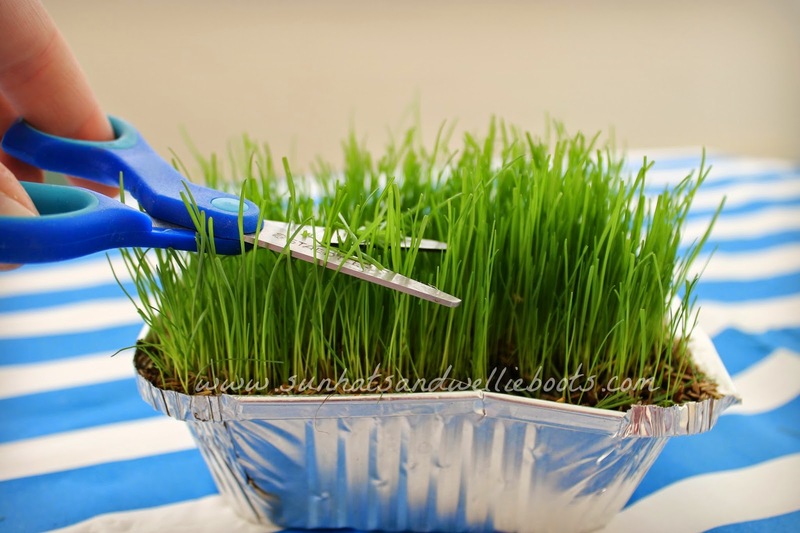 To grow our own pitch we filled a container with compost & sprinkled over a handful of lawn grass seed. We then added a little water & left it on a sunny windowsill to grow. I was pretty surprised at how fast it grew, & within seven days we had a tub of lush green grass. This looked beautiful but was rather long to play football on, so armed with a pair of scissors we cut the grass to a more practical length. 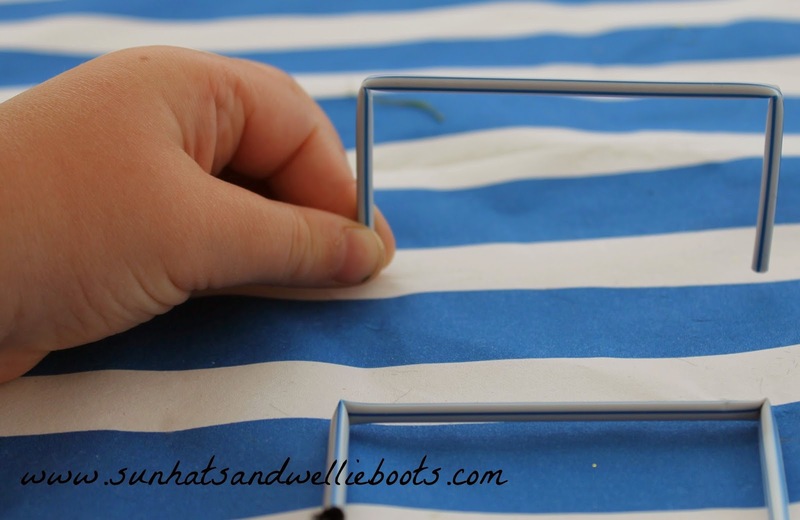 To make each goalpost we threaded a pipe cleaner through a drinking straw & bent into a goal shape before cutting each one to size. 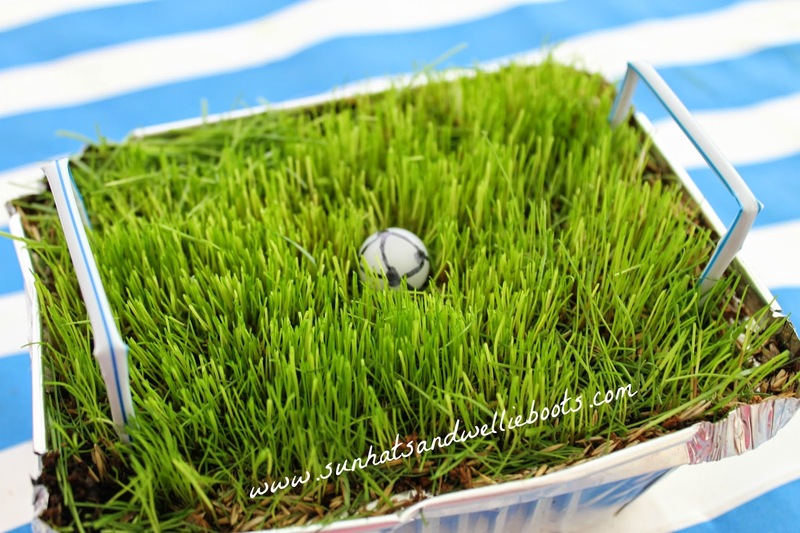 We pushed the goals into the grass at opposite ends of the pitch, & added our football. To make this we used a small ball from a marble run & added a little detail with a sharpie marker. Then we were ready to play, all we needed now were the teams! 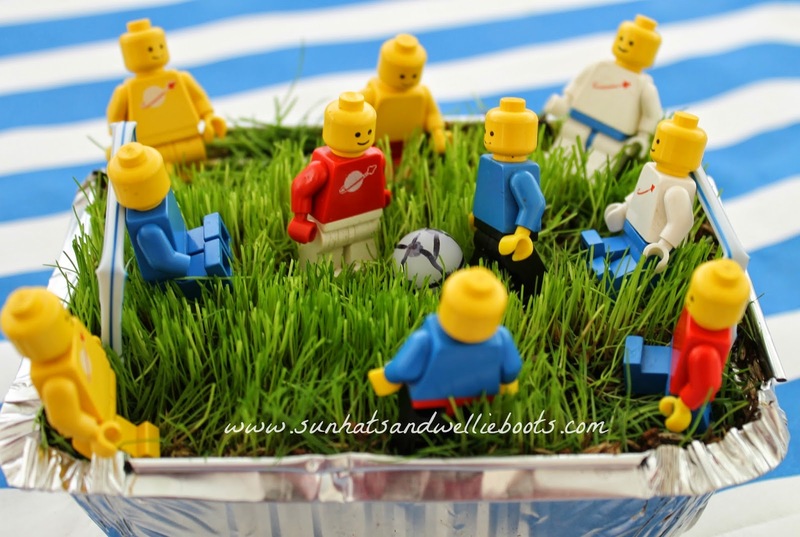 Our football field proved a popular place to be, & first to try out the pitch were Minnie's Lego Friends. They had a quick kick about, scored a couple of goals, but were soon turfed off the pitch by the five-a-side teams! The teams were lined up to greet each other before the match kicked off, & then placed around the pitch for the start of the game. 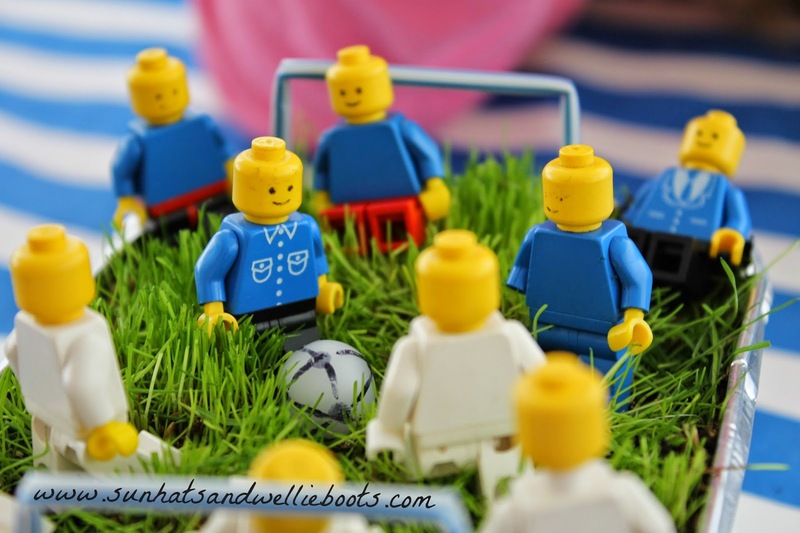 Minnie loved manipulating the Lego figures into different positions on the pitch & gave a running commentary as they kicked the ball across the field to each other. Most of the players were given a chance to 'kick' the ball, & the opposing teams showed some skillful tackling moves! Of course the best part of the game was when a goal was scored! Minnie recorded these on a sheet of paper before the players continued their game! This small world play set up has been played with again & again, indoors & outside. It's been great for encouraging Minnie's interest in football, & for her to recall the many teams that have played in the World Cup. We've been discovering which countries the teams are from on a world map, just as we did with the various countries that took part in the Olympic Games. Such a neat way to learn about our global neighbours. 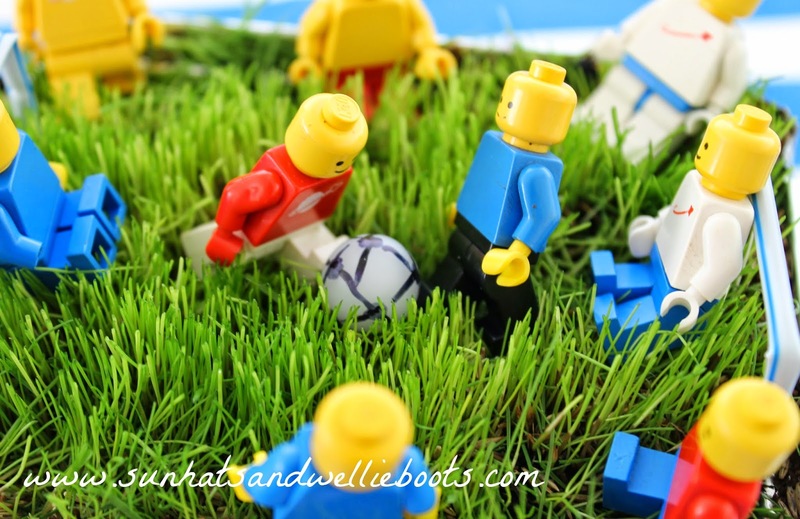 As a family we've also had great fun playing with this Lego set up, whether we've been playing on opposing teams, or moving the Lego figures around the field together. We've shared many giggles, & had the opportunity to explore a few different languages as we've practiced counting up to ten in the various languages of teams taking part! 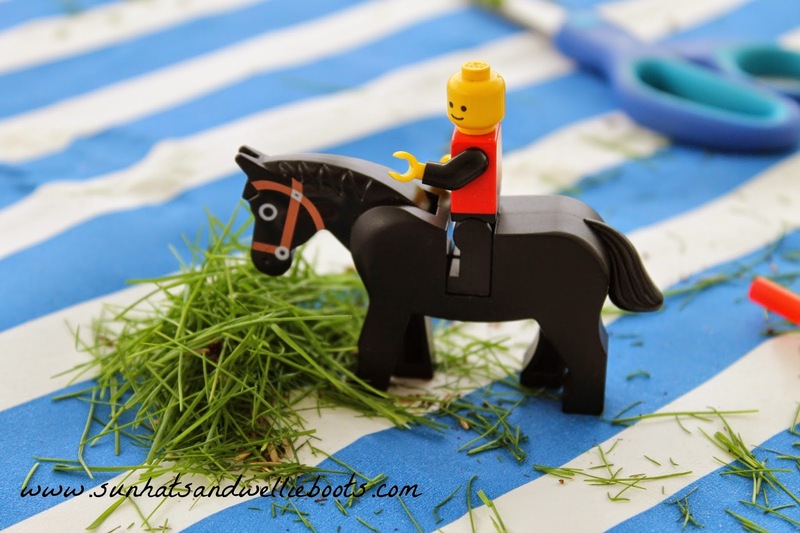 Oh, & if you think any grass clippings went to waste... they were all put to good use. 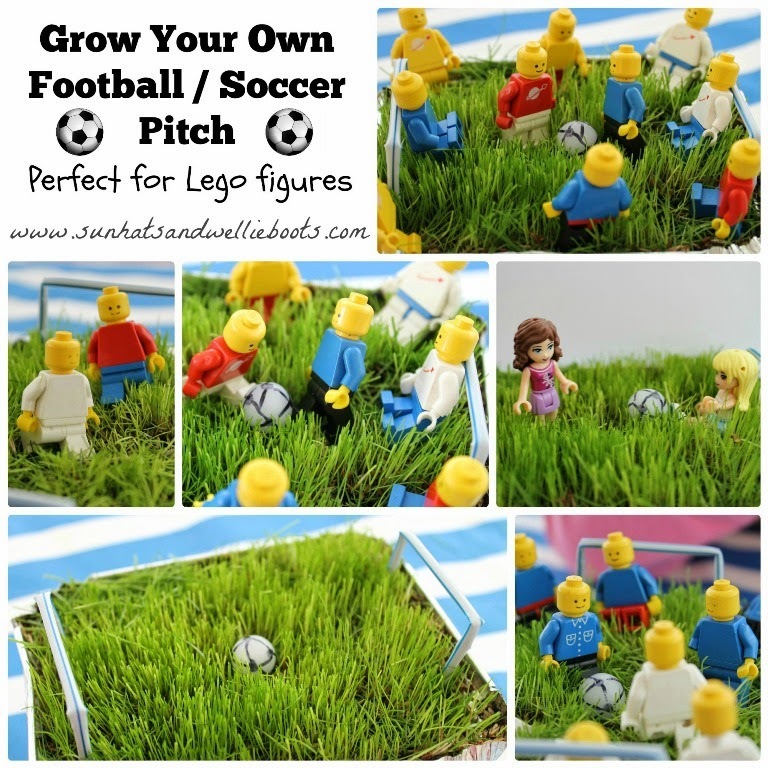 I love that this homegrown pitch along with the Lego figures has sparked so much imaginative play, language, maths, & interest in other countries. Such a simple, but fun way to explore the beautiful game!